In our continuing effort to make every single drink in the Mr. Boston Official Bartender's Guide, we bring you today possibly the easiest drink in the entire book: The Shandy. I first learned of this drink while watching "The Remains of the Day" where the beautiful Emma Thompson has one in a pub ("....another shandy, Miss Kenton?"). Made of equal parts beer and ginger ale, it's the type of drink that, uh, any self-respecting man would of course never drink. Clearly I would never be caught drinking one of these in a million years. However, as proof of the enormous sacrifices I willingly make in writing this blog, I will confess to taking a few furtive sips of Laura's. But there are certain advantages to the Shandy worth considering. First, you're drinking just 1/2 a beer at a time, so you can basically drink these all night and still drive home. 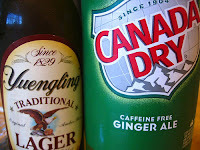 Second, there's absolutely no stress involved in getting this drink recipe just right--it doesn't matter whether you put the beer in first, or the ginger ale in first; either way it tastes the same. That's my kind of drink. Assuming I would drink something like this. Which I wouldn't. Finally, this is the perfect beverage to serve to someone who claims they don't like beer. You've heard of gateway drugs? Consider this a gateway beverage. Down the road your poor, poor beer-disliking companion will graduate from shandies to true beer drinking. 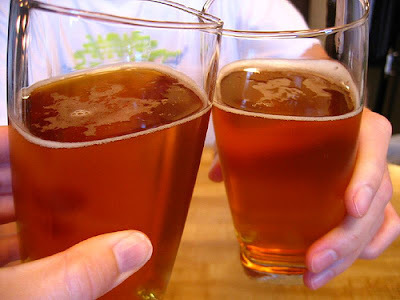 Fill a glass half full with beer, then fill the rest of the glass with ginger ale. Err .. we NEVER make shandy with ginger ale in the UK mate (sounds a bit disturbing in fact, although I'll give it a try sometime). Instead, we use lemonade with either lager or bitter. 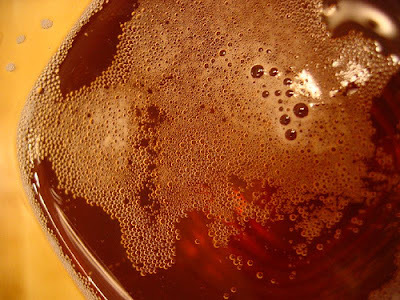 Lager with a dribble of lemonade is known as a 'lager-top'. Hi Anonymous, thanks for reading. Yes yes, it's lemonade. I loved these when studying in London.